Scalloped Pink Coat (comes in light pink and yellow, too! ): c/o OASAP. Cat Fur Lined Leggings (my aunt got me the same ones but in tights for Christmas): c/o OASAP. Raspberry Beret, Black Vintage Gloves: Thrifted. Lipstick in Forever21's velvet lipstick glosses. I get a lot of emails from slightly younger girls who are in high school, unsure of what to do with their life or frustrated in the situation they're in. Although I've been out of high school for almost two years now, I still remember having these feelings and how strong and confining they were. It's scary to have to pick what college you want to go to and what you want to do with the rest of your life. It wasn't entirely easy for me and I don't want anyone to think that. Although I found the right college quickly and haven't changed my major, that doesn't mean it's how it goes every time. Each individual story is different. The key to 'success' in transitioning from high school to college is simply just finding out what it is that you love. I've met a lot of people in college who go through half of their experience miserable with their major and for what? They waste two or three years and by the time they figure out they don't want to study that anymore, they're behind and have to stay longer. Do yourself a kind favor and think about what it is you really love to do before you declare a major. Not what your parents want you to do, what will make you the most money, or even what you feel like is just an 'alright' fit. Find a major you wake up every day being excited to learn more about and advance in. Don't kill yourself stressing about it in high school. Here's an inside clue--most people in college still don't know what they want to do, and even if they do stick with a major, it's not without a lot of doubts and second thoughts. I've just been super blessed to have found what I love to study early on. But did you know in high school I wanted to be a Spanish teacher? SO different than my current major! It was a process for me though in finding out what I loved and what I was passionate about, versus what I just thought would make me happy. Don't spend all of high school freaking out. I used up so much of my time worrying and fretting about grades and college and the future and it got me no where. I'm telling you right now in hindsight--I could have done without every single bit of worrying. Forget the ACT, the finals, the deadlines, the essays for a minute and just know that it is all in God's hands. Things will work out or not work out as they should and there is a greater plan for you. Put your cares and worries on Him-- it has helped me so much in college to know this, and is something I wished I would have done for myself throughout high school. And great words of wisdom! I graduated this year, I distinctly remember about four years ago freaking out about what I should do after graduation. God really spoke to me and I felt like He was telling me- trust Me and you'll be fine. Just rest in Me. It's very freeing to trust Hod like that, to not have to worry! Such wonderful words of comfort for young people. High school was a miserable time for me, so much that I never really gave much thought what I wanted to do with my life. I just wanted out. But everything works out, for sure, as long as you tune into the right frequency and listen with your heart. And of course since I am a big fan of cats and an even bigger fan of tights, those are so wonderful, dear. And your legs look stunning in them. I am also a fan of bright colors so the coat gets a big thumbs up as well. Love the pink color too--so pretty in pink! This is possibly my FAVORITE outfit of yours! EVER! I love everything from the tights to the coat! you look amazing! Aaah! Dearest Lauren, as a 16 year old high school junior who is thoroughly unsure about the future, this beautiful post could not have come at a better time for me! ♥ Thank you so much... oh my gosh. I have been praying about this so much, and have spent way too much time fretting and worrying and trying to figure it all out, and God really answered my prayers by this. It has really helped me to calm my flurried spirit and take a few deep breaths. I honestly needed this lovely reminder so much. Thank you, thank you, thank you! I love those tights. They are adorable <3 Fuschia is one of my fav colors though I do not wear it at all. Just feel it too overwhelming on my skin tone. But I really love it on you. That lip color is amazing as well. You always have such pearls of wisdom Lauren! 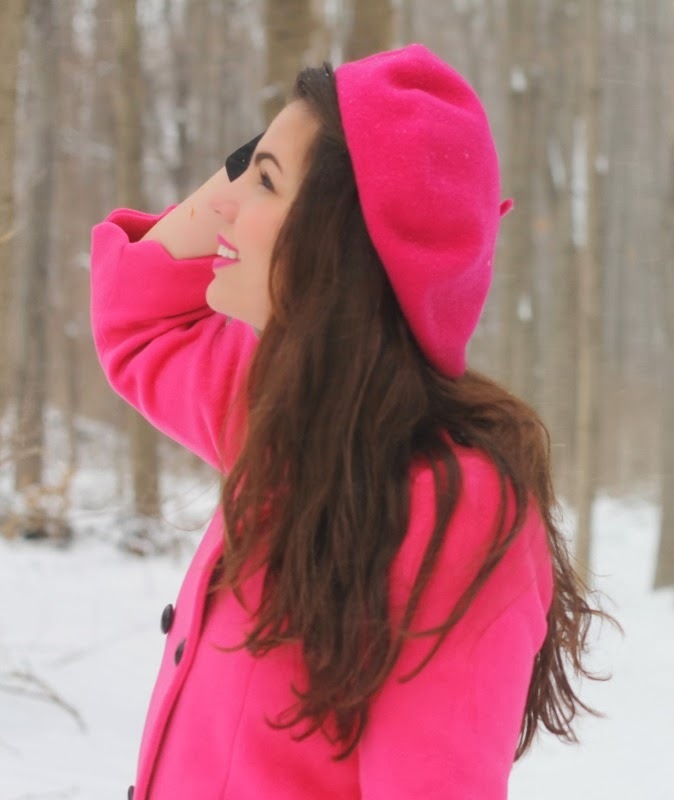 I adore the pink coat. such a sweet outfit! love this shade of pink, so pretty! Even after college one goes through the same struggles. I finished my education degree and graduated, and am now finding out that I hate it and wish I would have gone into a different field. Life is full of constant change and as you said, figuring out what you love is important! I love this sweet pink look on you. The close up photo with your lashes all snowy/sparkly is just magical! I'm guessing you feel a little cold, ya? However, this is one awesome outfit!!! What is it about scallops that makes them a fashion winner?? Really, are they tights??? Really want a pair now as I contemplated some similar tights from asos but worried they'd just ladder in an instant! It's so nice that so many of your clothes are thrifted and vintage. Not many people realize how cute thrifted clothes can be! I just love how girly and awesome this outfit is. I'll always have a soft spot for pink and black paired together. 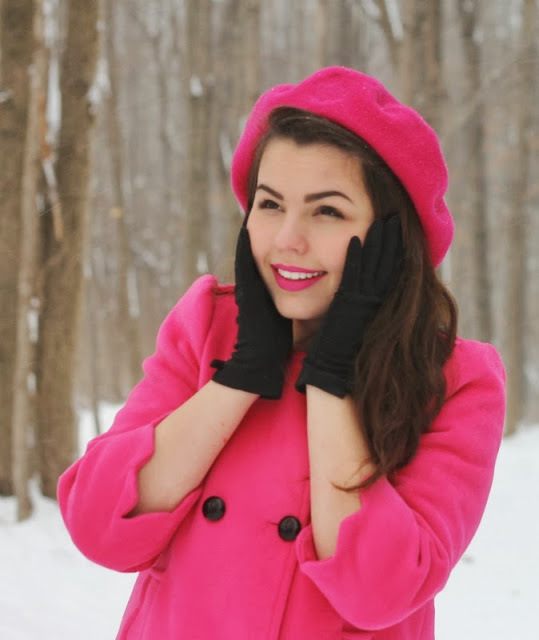 This coat is just the most gorgeous shade of pink and your cat tights are adorable. And hooray for being a positive role model for younger girls!